I haven’t written about the Skyline Walkway before, which runs along the ridges between Karori and Mount Kaukau. This is a shame because on a good day it’s a very nice walk, and very accessible. On a bad day it can be very exposed to strong westerly winds, especially in a couple of saddles towards the northern end. I’ve walked it a few times now, most often starting from the Karori end and once from the Kaukau end. The most recent time was last Sunday when I decided on a whim that I felt like doing something. Location: Skyline Track, Karori to Mt Kaukau. The Wellington City Council advises that it’s a “5 hour strenuous walk” , which is certainly true if you’re planning a family trip or an occasional outing. 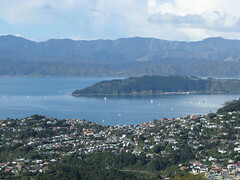 If you’re the sort of person who does a lot of walking and is reasonably fit, however, you could reasonably expect to get from the Karori end to the Kaukau end inside a couple of hours at a reasonably fit pace and if you had nothing better to do (not necessarily including getting down from Kaukau). It’d be feasible to do it quite a bit faster if you’re a crazy mountain runner, which some people are. Obviously there’s plenty of scope for taking a much longer time and enjoying it if you like that kind of thing. It’s also very popular with mountain bikers, and I’ve always seen a lot of people on bikes around here except for when the weather’s really icky, but at those times there aren’t many people around generally. One of the nice things about the Skyline Walkway is that there are also many exit points to get back down to civilisation if you decide you’d rather not keep going. 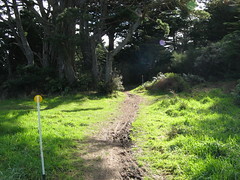 The Skyline Walkway officially begins from a little way up Makara Road in Karori. 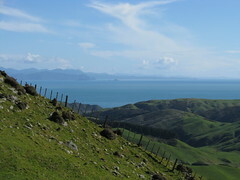 With Makara Peak on the southern side of the road, there’s a good signpost at the beginning of the walkway on the northern side, making it fairly hard to miss. If you’ve just walked all the way through Karori and feeling lazy like I was, though, it’s also possible to get up to near the beginning by walking up from the back of the Karori Park sports-field. There’s a small network of tracks back here and it’s not always absolutely clear which track to follow, but I found my way up fairly easily by tending towards the options that look as if they’ve been walked more heavily. Upwards generally seems to win. Going up this way probably reaches the Skyline Track at a point within about a couple of hundred metres of its official beginning (or ending), and from here on there are pole markers to follow. I reached the main Skyline Track at about 10.30am. There’s about 15 minutes of walking initially (or longer at a slower pace) before reaching the top end of Montgomery Avenue, which is one of the back-streets of Karori and another access-point to the Skyline Track. From here the track continues around below the western side of Johnston Hill. If it’s a nice day it’s often worth taking the detour which heads up to the top of Johnston Hill, which has some nice circular views around much of Wellington and out towards the top of the South Island, to the west. This is what I did, and reached the top a little after 11am. Even though it was quite sunny weather on Sunday, there had been a lot of heavy rain during the week. I was expecting a little mud, but hadn’t really considered that the track was already quite torn up thanks to everyone who’d been walking on it during Saturday, which had also been nice weather. 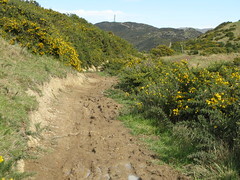 Furthermore, much of the Skyline Track is actively used farm-land, and north of Johnston Hill it entered a cow paddock, and that’ll usually mean a very muddy track. For part of this time I’d taken my own little off-track detour along a ridge above the main track which meant better views but also avoided much of the mud as a side-effect. Meanwhile, a family group who’d brought bikes finally decided to turn around down below, because the muddy track was becoming increasingly problematic and there wasn’t any clear sign it’d get better. (Regular mountain bikers wouldn’t have had any issues though, I don’t think, and I passed quite a few people going the other way.) Avoiding spooking the cows that were scattered all over the track was also an issue that required a lot of care. South Island on a sunny day. At 11.30am I walked past the signpost indicating another exit, this time leading down to Chartwell Drive. From about this point onwards, the Skyline Track stays quite near the high tension power lines that channel through the region, having been routed in from the Cook Straight cables. As with most of the walk, there are still great views in both directions along here, which is one of the nice things being on top of a ridge. Much of the official track runs slightly below the ridge-line, which is a very useful thing on days when it’s windy, but there are plenty of obvious side-routes that people have taken up to walk along the ridge-tops if you’re so inclined. 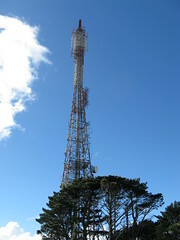 At 12.15pm I passed the top of Bells Track (also signposted), which leads down to Awarua Street in Ngaio. I’ve been up Bells Track once, which was a couple of years ago when I was in Ngaio and decided I wanted to walk home via the Skyline Track. The main thing I remember was that there was very low cloud and by the time I was half way up there was about 20 metres visibility, and I decided it’d be a bit silly to keep going. Especially when walking back towards Karori, there’s at least one place where it’d be possible to get on the wrong ride and potentially end up at Makara late in the afternoon, which I almost did on one occasion. From the top of Bells Track, Mount Kaukau is signposted as about 45 minutes, although at a fit pace it’s do-able in about 15-20 minutes. This is also a stretch which has one or two saddles that are very exposed to strong westerly winds if they’re present, and it’s possible that it may make a lot of sense to turn back or get down early if it’s a very windy day. This wasn’t the case today, though, with almost no wind, and instead I used the time to gaze at some of the sculptures that the strong westerly winds have left in the vegetation. 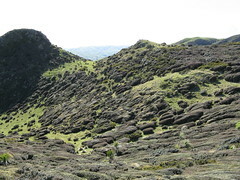 The grass in this region is permanently bent over from west to east, and the low bushes and scrub are visibly streamlined in ways that let the wind flow over them in that direction with minimal resistance. The whole thing looks impressive. And that’s what I did last Sunday. Lots of fun. The walkway’s definitely worth it if the weather’s nice. If the weather’s windy or overcast it can also be an interesting experience, but I definitely wouldn’t recommend it in those circumstances without some decent gear for staying warm and keeping off the wind. There’s also a lot of potential for getting lost or losing the track if there’s low cloud, and that wouldn’t be good either.